Karen's experience in education is broad, she engages audiences in creative processes, assisting participants in questioning, exploring, inventing and enjoying visual art. She works with a range of groups including schools, families, young people, adults and community. Karen devises and delivers innovative, cross-curricular workshops tailored to each clients needs. 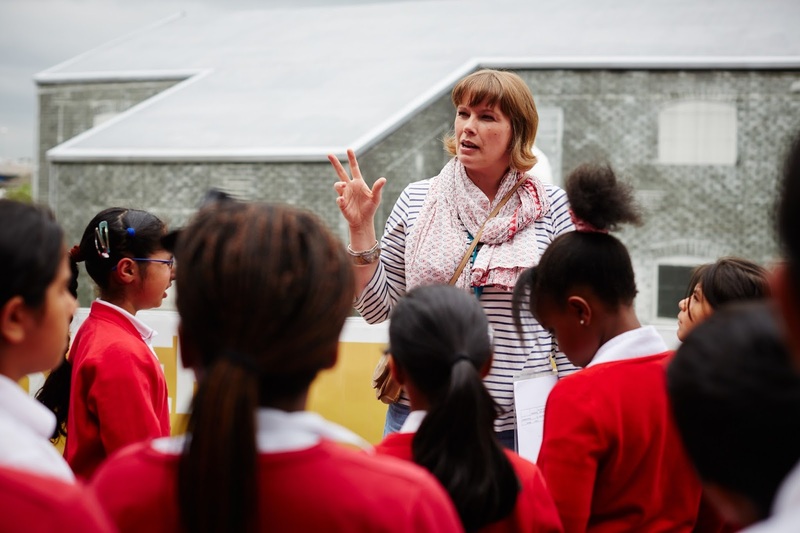 Karen works in galleries, running sessions which respond directly to work in the galleries collections and leads visits for schools which introduce approaches to working with art in the classroom. Karen's current DBS certificate is dated January 2019 and she has Public Liability Insurance. 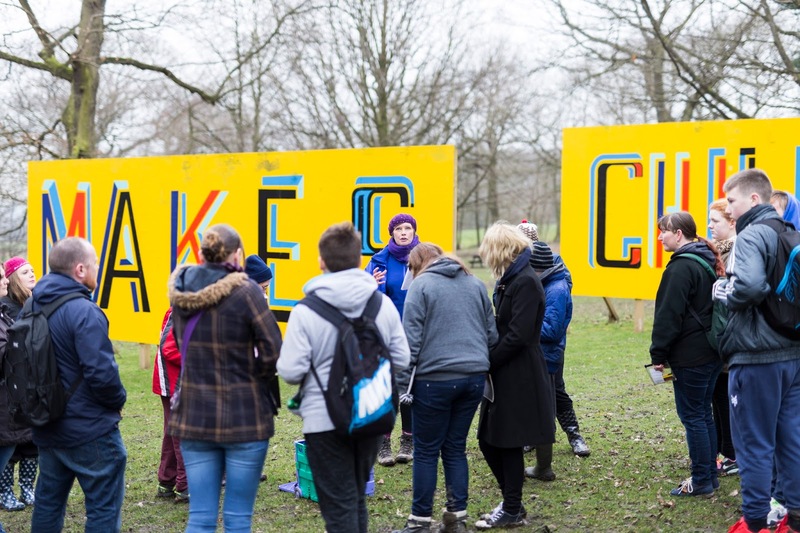 Out & About 2017 was a fantastic opportunity for learning and adventure in sculpture and landscape, working with three secondary schools in the Wakefield District. During Out & About we journeyed to Brimham Rocks to consider natural landscape, Nostell Priory to observe designed landscape made pleasing to the eye, then to The Hepworth Wakefield responding to sculpture and the purpose built gallery and finally to Yorkshire Sculpture Park to explore sculpture in landscape, a perfect conclusion to our project. Working with a mix of pupils and family members, Out & About allowed time and space to explore and think, to share, create and simply 'be' together. The participants jumped in with curiosity, pushed and challenged themselves to experiment with unfamiliar ways of looking and responding to the world around them. They MADE the project. During our celebration event at The Hepworth Wakefield much excitement was caused by the first showing of the project film, created with great care and attention by Nick Singleton who beautifully captured the essence of Out & About 2017. With thanks to Natalie Duffield-Moore, Formal Learning Manager at The Hepworth Wakefield. How has this project made you powerful? My experience at The Hepworth Wakefield was magical and memorable. As part of the creative practitioner team (in place before the gallery opened in May 2011) we collaborated, invented and shared ways in to the breadth of art within the collection and temporary exhibitions. This post allowed space to try out ideas, be playful and responsive in an atmosphere of trust and support. Highlights include, inspiration from Clare Woods: The Unquiet Head in creating vinyl installations, assembling a huge drawing for the Grand Depart, working alongside local primary and secondary children learning about sculpture during Out & About and yarn storming Wakefield City centre with a group of energetic young people. This fabulous group of young people meet in the learning studios to make and create together. I'm a cog in a programme of diverse prompts to the group, working in collaboration with the learning team and creative practitioners sparked by the exhibitions at THW. ASC (Art & Social Connections) statement written by the young people (formally IYP - Integrated Youth Programme). ● We are a group of young people who meet every Friday at The Hepworth Wakefield. ● We enjoy being creative together, building skills and developing confidence and friendship. ● We hope that in the future, we will use the knowledge and experience gained to help us find exciting opportunities. Over the weekend of the 22nd/23rd of October we welcomed 270 participants of all ages into the learning studio for the STEAM Powered Big Draw Festival, inviting them to explore science, technology, engineering, art and maths. There were happy faces as inspired folk made and drew in seriously inventive ways. Following the weekend I led workshops for 7-11 year olds inspired by Fiona Banner: Buoys Boys and Peter Blake: Alphabets, Letters & Numbers. At Drew I worked with every child and teacher from y1 to y6 in this two-form entry school. Taking my inspiration from the book each class was reading at the time of the art project, my bespoke cross curricular projects blended art and literacy and provide a strong grounding in art techniques, materials, processes and contemporary art. My time at the Agder Folkehøgskole began with a talk to the entire school about my 2015 Coast to Coast walk. This talk led onto my next, specifically for the art department. As the auditorium emptied the space became more intimate and I shared my art practice with the art students. Returning to the studio each student wrote a word in response to my artwork and these words were randomly selected to became starting points in creating artwork using found/scrap/discarded materials. Alongside the art tutors we worked intuitively, our studio time was spent allowing the exploration process to flow, with opportunities to share progress, ask questions and for responses to the evolving work. We were conscious about intention and viewer interpretation. Towards the end of our project the students took their work into the schools beautiful surroundings to photograph. 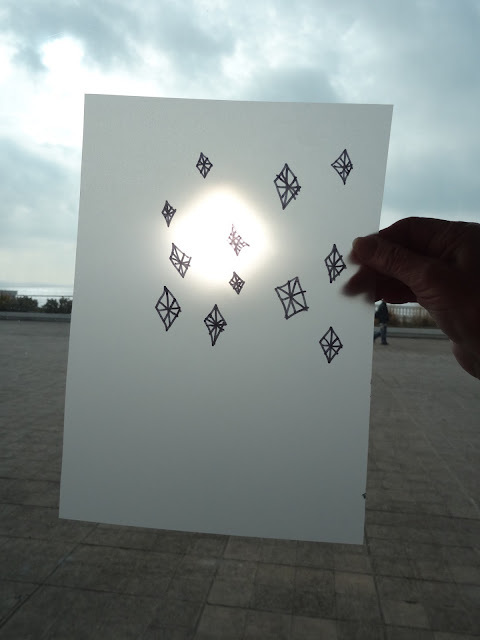 They considered how meanings and interpretations were altered outdoors, some collaborated, changing meaning further. We staged an impromptu exhibition in the school, finding plinths, working with internal architecture, staging photographs. During this experience I felt trusted, supported and appreciated and look forward to future collaboration with the Agder Folkehøgskole. 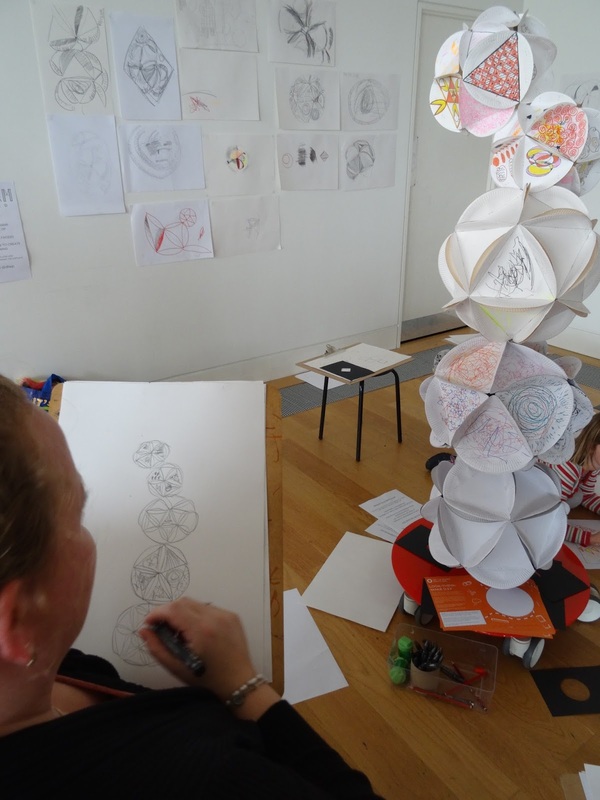 Young people under the care and guidance of Wakefield's Youth Offending Team joined us at The Hepworth Wakefield for our first Unitas Summer Arts College. This intensive three week project, devised and delivered by myself and sculptor Gillian Brent used Haroon Mirza's exhibition as a jumping off point. We explored creative processes including sound, film, installation and creative writing. We also physically explored the local area on a series of visits developing social skills, literacy and numeracy through art. The group titled their sharing event and exhibition High Light. High Light was packed with youth workers, Hepworth staff and the friends and family of the young people. We had much to celebrate as each participant achieved a Bronze Arts Award, for some their first qualification, 7 out of 8 improved their literacy and numeracy and all had college places to continue their studies at the beginning of the academic year. One young man commented, 'This is the best night of my life', he was centre of attention because his sculpture was placed in gallery 10 for the evening. For more details of our learning journey please see these blog posts: light and structure, audio visual, welding words and high light. Funded by Artists Rooms A September To Remember was devised and led by myself and artists Gillian Brent and Bryony Pritchard. The intensive three week project brought together a group of young people who had not met before and who were unaware of Richard Long’s work. We challenged them to create artworks in physical and exciting ways - walking, looking, listening, responding, measuring, making, drawing, creating text and discussing. Our explorations culminated in an exhibition in The Hepworth galleries. The consensus within the group was that the show was not an end point, a destination, but that it celebrated their personal development throughout the project and hinted at continuation. Considering this, the title Until The Far Distance suggested onward momentum and turning towards the future. 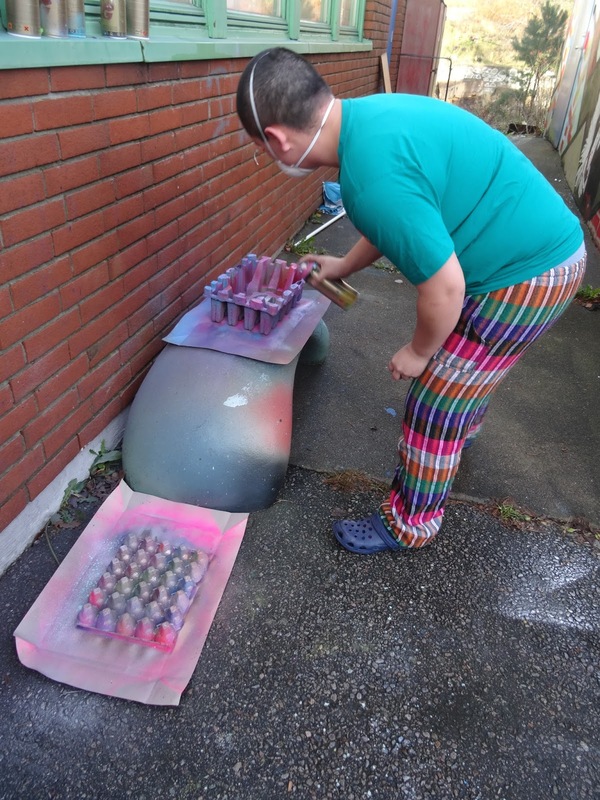 The young people were involved in all aspects of staging the show, not only creating the work but meeting the Hepworth curators and marketing team, finding their group voice, designing and distributing invites, writing a press release, titling the show and planning a menu of skills sharing workshops for the public, led by the young people during the celebration event for their show. Seven participants started and seven remained for the whole process, an amazing journey with learning for us all. Each participant also completed and passed their Bronze Arts Award, one participant Vicki being asked to consider becoming an Arts Award Advisor. Residency exploring the theme of friendship in the Warwick Estate, Knottingley. We made stuff, drank tea and ate home baking while chatting to one another about our everyday lives. Our project was awarded additional funding from the NHS as it had a positive benefit on participants mental well being. See blog for an in-depth week by week account of Sites in Sight, plus the recipes shared during our project: Sites In Sight. My brief was to inspire staff to use contemporary art in the nursery. Working with toddlers and 3-5 year olds making 2D/3D work exploring materials and nature: from bug hotels and garden sculpture to decorating fabric for reading room cushions. During the project I compiled a library of resources for staff, led two INSET's, started a parents sewing group, led a trip to a sensory garden and ran a saturday workshop for families. The research and development stage of this innovative community engagement programme ran between May and July 2008. As one of five creative practitioners in five secondary schools in Gravesend and Dartford we delivered collaborative workshops exploring and encouraging an appreciation and understanding of the proposals for a 50 meter high sculpture in the Ebbsfleet Valley. Each school 'adopted' one of the artist's proposals: ours was Mark Wallinger with his white horse sculpture. The group were dynamic, bursting with creativity, energy and ideas: we considered site specificity, conceptual art and the site of the sculpture visible from the school's art room. We had fun making interventions in school, including a pantomime horse roaming the corridors and school grounds and ended our research and development stage with an information event sharing our discoveries with the school community. What does 50 meters look like? Communication, Culture and Rhythm involved reception, Year 3 and Year 4 classes exploring nonverbal communication at Churchfield Primary School. We learned Makaton signed language, semaphore, colour meaning in different cultures and considered how facial expression and gesticulation are used to communicate. Diverse outcomes included bunting and paintings featuring pupils signing, colour coded letters, colour 'messages' printed into strips of cloth and large banners featuring wonderful mark making and drawings. At the close of our project the classes and teachers surprised me with a celebration assembly where the children read letters and poems they had written to say thank you and presented me with a huge bunch of flowers. Semaphore - what are they telling us? I ran sessions in galleries responding directly to artwork in their collections and tailored each workshop to the school needs and interests. I provided INSET sessions and led gallery visits introducing cross curricular approaches to working with art in the classroom.